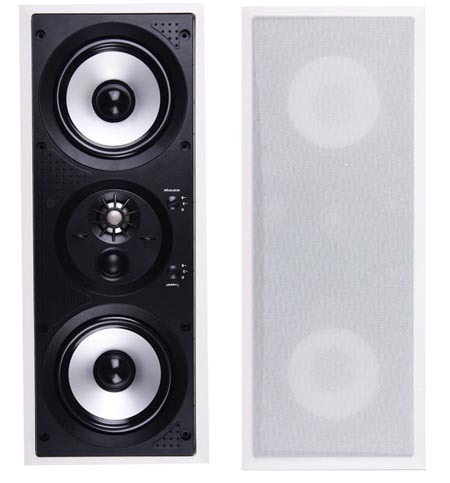 Cut Out Size: 20.91 x 7.91"
When it comes to rich sound, a full range of great-performing components and the quality necessary for an excellent in-wall speaker, it is difficult to beat the Premier Acoustic PA-626. This well-designed in-wall speaker has what it takes to deliver the lows, the highs and the overall beauty of any music you want to play. On its website, Premier Acoustic displays the slogan, "What a beautiful sound," and clearly this company credo carries over into its in-wall speakers. The Premier Acoustic PA-626 in-wall speaker delivers stellar sound quality that makes listening a delight and since the quality is so good, you might expect to pay considerably more for a wall speaker like this. However, this speaker offers both excellent sound and a good value . The Premier Acoustic PA-626 easily earns our TopTenREVIEWS Bronze Award.